Google’s expanded sitelinks give sites greater exposure for branded searches and the ability to dominate the page one results above the fold. User reactions have been mixed so far (some find them overwhelming or borderline obnoxious) but Google is touting the user benefits and the expanded sitelinks appear to be here to stay. That means that sites should take advantage of the opportunity to increase clickthroughs to those pages by optimizing their META description tags in a slightly different way. 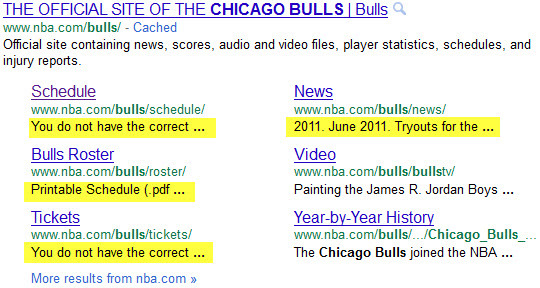 This gives new importance to the first several words in the META description tag on those pages. While not a lot of room to work with site owners should ensure that those opening words result in a meaningful snippet. When the sitelinks expanded, we optimised each meta desc for the pages which were appearing, but Google chose not to update their snippet – even after the pages in question were cached twice. “Still life in the old meta description yet”. Nice insight, interesting to see how pages with no meta description are being displayed in these site links. Jim, that’s an interesting point. If the sitelinks for a particular site are only updated at periodic intervals (separate from regular re-crawling and re-caching of those pages) it may take some time before the new descriptions appear. great post. i’ve noticed lots of ‘dirty’ descriptions showing up for these links. Bill – in that Sports Authority example it looks like their site would benefit not only from improved formatting of the META description tags on the sitelink pages but also the title tags. The sitelink text needs better differentiation. I dont think that meta tags nowadays make any difference. Google dont crawl meta tags. John – You are probably thinking of the META keywords tag. The META description tag does not help with ranking but it does help to increase clickthroughs from the SERPs, so it is well worth optimizing. Mike – Sitelinks are automatically generated by Google, so unfortunately there’s nothing you can do within your code to make them trigger. 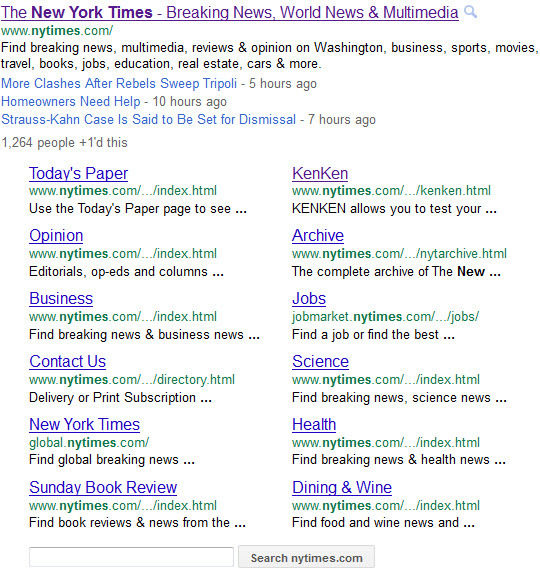 I’m curious if you have any idea how often the sitelinks are recrawled and reindexed on the SERPs. One site I’m working on did a redesign, and google crawled the site but has not yet updated the sitelinks. Any idea what the interval is? That’s a good question Nicole. Quite a while ago Google had noted that sitelinks are recalculated and updated every several weeks. The interval might be quicker now but it’s not unusual for it to take a while (not counting the “fresh sitelinks” to new articles that some news sites also get). Is there any specifi tag to recommend Google some sitelinks ? I only see a tool in Webmaster Tools to retrograde sitelinks but none to suggest ones. 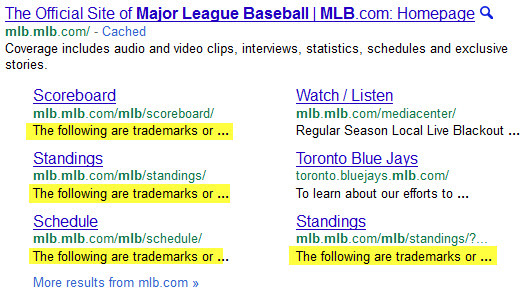 Maybe there is a way of tagging the site that can help Google to discover the best sitelinks ? Peters, the sitelinks are triggered algorithmically so unfortunately there are only ways to demote them but not to suggest them. I agree Carl, there’s only so much you can accomplish in that space. With that in mind I think the main goal is to ensure the opening portion of the description as it least somewhat meaningful, so searchers can get a rough idea of what the page is about. Engaging is probably too much to ask, and better suited to the full 150 character-ish description.